Shower set ups for free camping and travelling with kids. One of the big considerations when you decide to travel, especially if you aim to free camp, is having showers and staying clean. Gone will be the days of unlimited streaming hot water, and long hot baths, but it’s really just a case of being practical, thrifty and sensible and once you find your groove it’s not too hard at all. We get lots of emails asking about shower set ups for free camping and travelling on long term family holidays, so here’s some starting pointers. Options for keeping clean quickly while travelling? 2: Hand Sanitiser – The water-free kind. Baby wipes are great for an all over clean up, or just the vital areas. Hand Sanitiser allows you to ensure your hands are clean and hygienic, so a combination of these works great for a light freshen up. It’s surprising how effective a sponge bath can be. 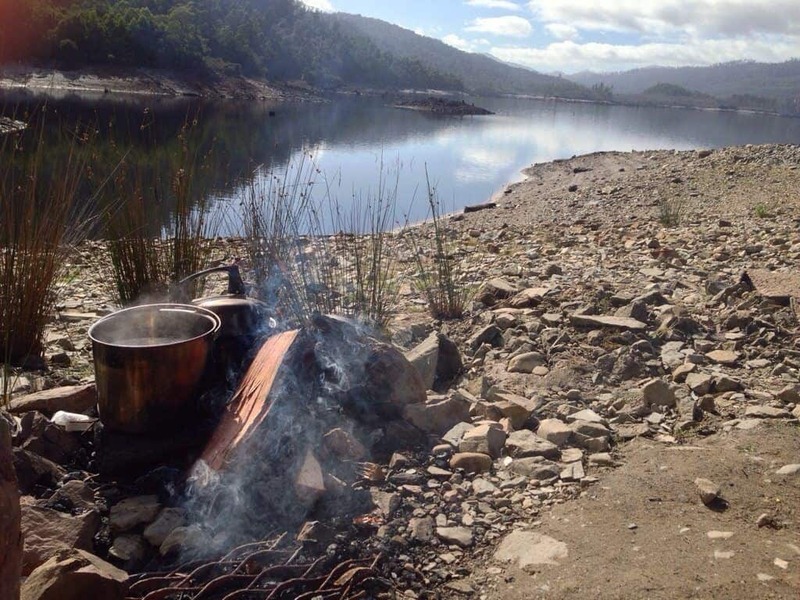 This is a common option for campers and travellers when there isn’t another option. A small bucket or large bowl can be filled with warm water and a face washer or cloth is all you need to get a thorough clean. For travelling families who need a little privacy a shower tent is a great idea. Another handy thing to know is that using sensitive skin, soap free options will still clean you but you don’t have to worry about the skin-drying soap residue if you don’t have running water to rinse with. The ultimate in shower options for Travellers and campers is to imitate a “real” shower as closely as possible, and this is where camp showers come in. This option is a tried and true remedy for accessing heated shower water when camping. Black rubber bags are laid in the sun for a natural heating method. It’s best suited to when you are staying more than one night as the water bladder will need to lay in the sun for the day. Similarly it’s better for warm regions as the bags won’t heat properly on cold, overcast, rainy days. Of all travelling families we’ve spoken to, this option is probably one of the most common options for showering while camping. 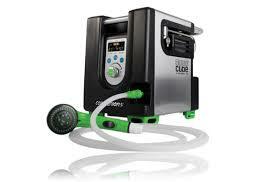 It’s simply the use of a portable 12 volt shower pump. Heat up some water, over the camp fire is a great option for saving gas and making the most of the fire, other than that, just on the gas stove will do. Mix the hot water into a bucket with some cool water until it’s the right temperature and then use this and the portable shower to wash.
12 Volt showers are mostly hooked up to a battery, either the car, or a spare to run the shower pump which is immersed in the bucket of warm water. For those who don’t want to worry about having to pre-heat water, the use of a hot water service offers even more convenience. You’ll still need a bucket of water, but instead of having to preheat, the 12 volt shower runs as part of the hot water service, which has an adjustable temperature gauge on it. Brands such as Coleman hot water on demand, and Companion Aquacube are popular choices. The vital ingredient for this type of shower is the shower tent. These range from pop-up kinds to more sturdy dual ensuite options. Regardless of which one you purchase, it will provide welcome privacy for both a shower, and if you carry one, a portable toilet. It’s a great idea to put some foat matting at the bottom of your shower tent to keep your feet clean and allow the water to run away. This type of matting is available at camping and discount stores. 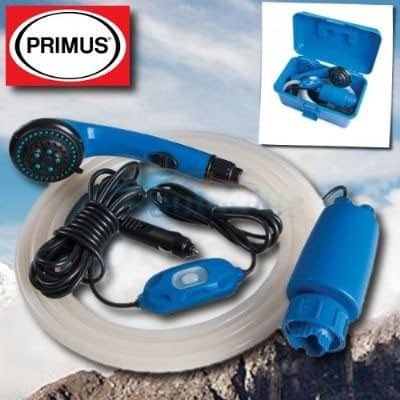 When camped near a clean power supply such as a river or lake, this will allow you to use available water supplies instead of water that’s better saved for drinking and cooking. If you can make out in our photo here, we’ve got 3 pots of water on the fire to save on the gas so we could have enough hot water to wash everyone. It took a few rounds of water, but the water from the lake was fresh and beautiful, and it was a lovely warm day, perfect for a good clean up for the kids. 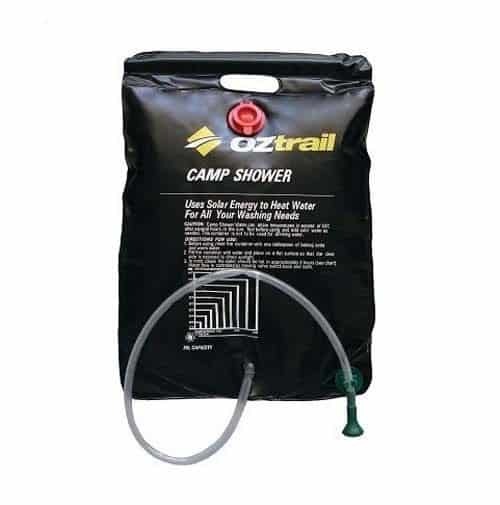 What tips do you have for camp showers while travelling?